Mercedes boss Toto Wolff said 2018 was his team's "most challenging season" after picking up a fifth consecutive Formula 1 constructors' championship trophy. 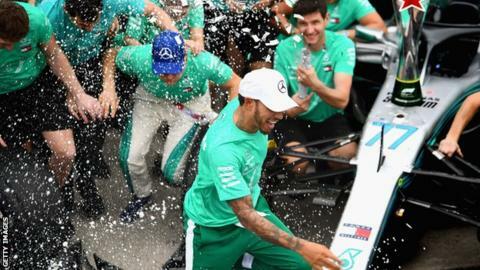 Briton Lewis Hamilton was also awarded his fifth drivers' championship trophy at a gala in St Petersburg, Russia, staged by governing body the FIA. "We all had to raise our game, each and every member of our team," Wolff said. "Winning both titles is a testament to the incredibly hard work of the team." Mercedes won 11 of the 21 races in a season that also included 13 pole positions and 26 podium finishes, while Hamilton became the joint second most successful driver of all time. Hamilton joined Argentine legend Juan Manuel Fangio on five championship wins, behind Michael Schumacher who won seven titles. But Hamilton - and Mercedes - had to fend off a strong challenge from Ferrari, with Sebastian Vettel and Kimi Raikkonen eventually finishing second and third in the drivers' championship. "I feel honoured to receive this trophy on behalf of everyone in Brixworth, Brackley and Stuttgart who helped to win these championships," Wolff added. Elsewhere, Britain's George Russell was awarded the FIA Formula 2 drivers' championship trophy after securing the title in Abu Dhabi in late November, while Germany's Mick Schumacher was awarded the Formula 3 European drivers' championship trophy.